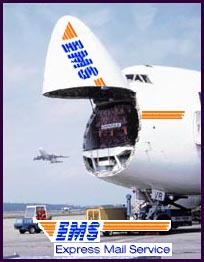 From China, Express Service is known as EMS. This method is the fastest via your local post office. It only takes a week to most destinations in the world. They can also be tracked online, but only after they reach your country. Express Mail sent Registered. Registered means that the package is tracked to your door and must be signed for. Add 1% of value for optional insurance. No insurance at your risk. Delivery directly to your door by your local postal person. To use the tables below, just plug the kilo weight and cost for your country into the above formula.